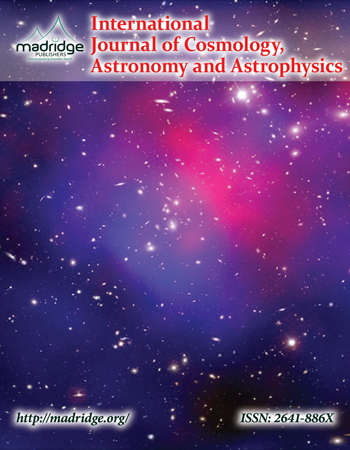 International Journal of Cosmology, Astronomy and Astrophysics (IJCAA) is an open access Journal that publishes papers on all aspects of Cosmology, astronomy and astrophysics and encompasses theoretical, observational and experimental areas as well as computation and simulation. The journal is published by Madridge Publishers. The main aim of this journal is to provide a platform for scientists and academicians all over the world to promote, share, and discuss various new discoveries, issues and developments in different areas of Cosmology, Astronomy and Astrophysics. IJCAA welcomes the submission of research articles, review articles, short communication, rapid communication, letter to the editor, case reports and it publishes papers on all aspects of Cosmology, Astrophysics and Astronomy, including instrumentation, laboratory astrophysics and physical cosmology. Critical reviews of topical fields are also published. IJCAA publishes original hypotheses and discoveries in cosmology, astronomy, space science and technology, astrophysics, astrobiology, plasma physics, and Earth & planetary sciences. It covers multiple disciplines and sub-disciplines of biology, geology, physics, chemistry, extinction, the origin and evolution of life and Martian colonization and exploration. It mainly focus on the conceptual problems of the current paradigm of early universe cosmology and astronomy, thus motivating an exploration of the potential of string theory to provide a new paradigm. Madridge Publishers is licensed under a Creative Commons Attribution 4.0 International License.